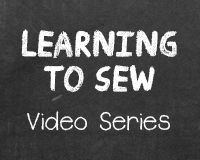 5 Tips to Improve Your Hand Sewing | Do-It-Yourself Advice Blog. The best hand needles for sailors are forged from cast steel and feature reduced edges, triangular points, and long eyes for easy threading. A great brand that has all of these qualities is William Smith & Sons. It can be tempting to try and save a some money by using cheaper needles, but inexpensive needles will break as you try to push them through thick fabric assemblies, so buying a high quality needle right off the bat will lead to fewer headaches and improve your hand sewing experience. It also helps to use a sailor’s palm when hand sewing. Not only does this hand thimble make it easier to push the needle through heavy fabrics, but it also helps to prevent needle breakage. In really thick assemblies, use a standard awl to pre-punch holes in the fabric for your needle to slide through. 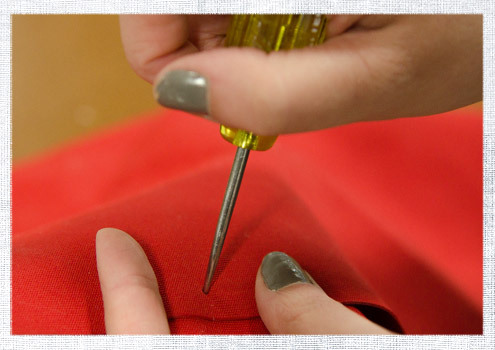 The sharper point on the awl will puncture the fabric much easier than your needle, and will save you a lot of effort. This will also help you create uniform and evenly spaced stitches. Knots can abrade over time and fall off causing your stitches to unravel. We recommend avoiding knots altogether. To do this, leave an inch of starting twine exposed and lay it where you will be sewing. Then, carefully sew over the tail, trapping it under your stitches. 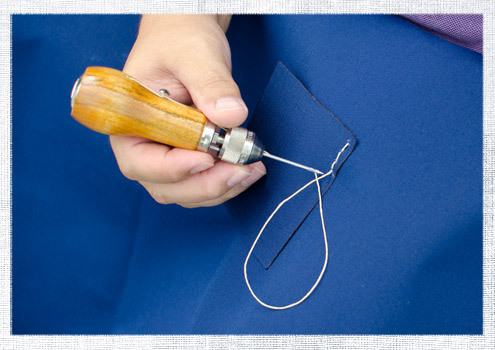 The Speedy Stitcher is a sewing awl that makes quick and easy work of seaming repairs. This tool can sew both heavy threads and twine in canvas or leather. The Speedy Stitcher can manually create lock stitches just like a sewing machine. Best of all, they are really affordable and the convenience of having one is really worth it. 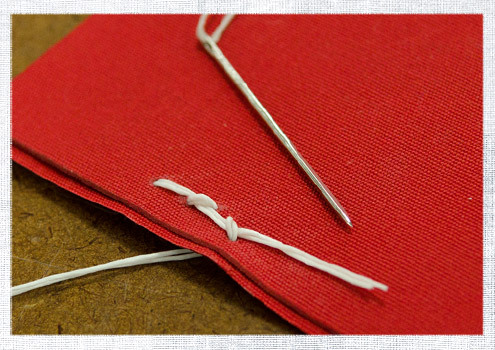 When you need to sew a seam, use a flat, waxed twine. Twine typically has a round construction, but a flat twine will lay closer to the fabric and therefore be less likely to chafe away. 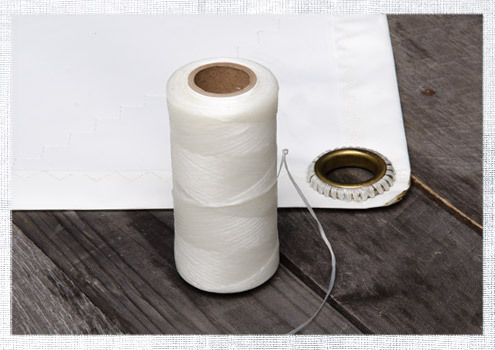 Flat twine is also great for sewing rings, because the twine will sit closer to the ring. This makes it less likely to get cut when an eyelet is installed. 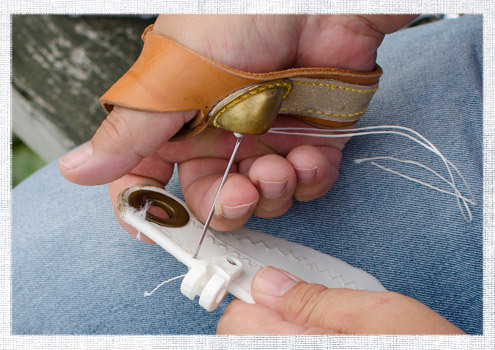 Find hand needles, sewing awls, twine and many more tools and supplies for sewing by hand at www.sailrite.com. What are your best hand sewing tips? Share them with us in the comments! Ha! That’s a great tip, John, I wouldn’t have thought of that! I sew huge traditional sails and using a palm and needle is an every day occurrence. Some of the sails are so thick that I end up breaking the eye of the needles due to the force required, and taking the idea of pre-punching the holes further, I stick another hand sewing needle in a battery drill and push that through the cloth. I can go through 10 layers of 17 oz cloth no problems and without tearing the cloth fibers. It is called a Speedy Stitcher, you can find it on the Sailrite website by searching for “20090”.